About a year and a half ago I stepped foot into Utah for the very first time. A few months later I came back for my cousin’s wedding. My cousin is a Midwest transplant to Salt Lake City (much like I am). He met the love of his life and got married out here. The night before the wedding was my first real introduction to Utah. After a nice dinner with my family, we decided to venture out into downtown Salt Lake at 10pm on a Friday night. After the first two drinking holes we tried to visit turned out to be closed—(yea…have a moment to take that in and fully comprehend…Friday night…10pm…downtown…in a major city…all right you got the picture? Perfect. )—the third place we walked into welcomed us with open arms. Well, kind of. We stepped one foot into this debaucherous house of ale and we were immediately informed that we must order one appetizer. My wonderful mother exclaimed, “Perfect!” as my sister added, “Not a problem!” before the stern door greeter could finish his drinking requirements. “You must order one appetizer each,” he finished. But we just ate dinner good sir, we are not very hungry in the least. No dice. You see, this pleasant establishment was more a restaurant than a bar. So by law, they were not allowed to serve us alcohol without a minimum amount of food being purchased. In the great city of Salt Lake, in order to serve a patron drinks without eatables, a bar must charge a membership fee. A one-week membership typically costs $5, the normal cover charge for a popular establishment on a popular night. This was for all bars, however, every single one. All the way down to your 5 stool hole in the wall on a Tuesday afternoon. That is, or was I should say, until July 1, 2009. Those days are over! I know your excitement is less than overwhelming, since this concept of memberships is absolutely foreign to you, but you don’t know how great it is not to renew the 15 memberships my wife I possessed last year. 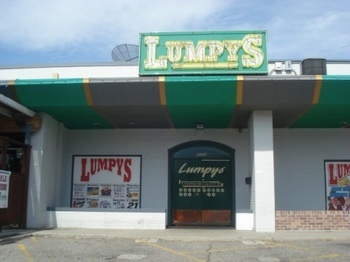 You don’t know how wonderful it is to drive home from work and think, “I’m gonna grab a beer and catch the end of the game,” and not have to drive across town to Lumpy’s because I was a member there. And I have only lived here for a year. I can’t imagine how excited those of you that have suffered longer must be. Driving down the road and getting a frosty beverage is now only 50% more difficult than it is in the other 47 contiguous states. For me, that’s something to celebrate. The title to my blog is the words to a banner currently posted outside of a local establishment. I saw the banner walking into the bar and thought, “Clever.” I know. I’ve clearly lived here awhile when I can enjoy a joke like that. Why, you ask, does enjoying that joke mean that I’ve been in Utah awhile? Simple. That’s not even a joke! It’s not funny in any part of the U.S. except in Utah. But, alas, Utah is where I currently reside and I find that banner clever. (A local but more universally humorous slogan is that of Park City’s Wasatch Brewery for their Polygamy Porter: “Why have just one?”) Salt Lake City has some wonderful things to offer. That being said, it has numerous pitfalls that any state that fails to successfully separate church and state will encounter. Sadly for them (or maybe for me), in my mind the greatest of these is the inability to accept the warm embrace of alcohol. As I sit here sipping my glass of lower-than-normal-alcohol-content Cabernet, I can’t help but smile because the repeal of the membership law is proof that SLC is getting there. In my one year here, I’ve come to believe that the major problem with this city is that everyone else is a few drinks behind. Maybe they’re finally catching up. Add in the fact that they have not so slyly lessened the alcohol content of my drinks and maybe all of us can meet somewhere in the middle. As I moralize to you while sitting on my soap box (let’s face it, someone who enjoys alcohol as much as myself isn’t standing), let me, in the words of the late great Frank Sinatra, help you understand why memberships, prohibition and an empty glass all cause me to yearn for greater world in which we live, “I feel sorry for people who don’t drink. They wake up in the morning and that’s the best they’re going to feel all day.” I for one refuse to let grogginess and bad breath be the paramount feeling for my day. I expect more of myself. I expect more of my day. I expect, well, grogginess and bad breath at the end of the day as well. I am a member of many things. Look in my wallet and you will see my Costco membership card (probably my favorite of them all), my Birkram membership, my Blockbuster membership – the list goes on. I love being a part of things and proudly jam each and every card bearing my belongingness in my teeny tiny wallet. When I moved to Salt Lake a year and a half ago, I purposefully shredded the memberships to an assortment of clubs and groups in Seattle and Portland, thinking I would not need them for quite some time. A thinner wallet, to me, meant a new beginning. New things to try, new places to find belongingness. Turns out, in Salt Lake, that not only was I going to refill my wallet with gym memberships and the like, but I would soon be collecting membership cards to bars. You heard it folks, bars. Now, before you pick your jaw up off the ground, listen to this: for the first year I lived in Salt Lake, I had to hand over my drivers license to each and every door man and woman in the state of Utah to not only check my age, but to then copy all pertinent information into a “system.” Once this process was complete, I then had to hand over a wad (wad = approximately $12) of cash, completing a “membership” process. Mind you, one only has to do this once a year (depending on the type of membership purchased – I always nabbed an annual pass) at each bar visited. Nice for some, not for me, as I was continually visiting new drinking establishments, trying to figure out which were worthy of my attendance. It doesn’t end there though. Many of these bars actually had the balls to charge a regular cover on top of said membership fee already in their hands. (Lift jaw from ground, the story will get saner soon, sort of). “Why a membership?” you might ask. Rumor has it that it 1. deters citizens from drinking, 2. allows the fine Mormons of Salt Lake to keep tabs on who is drinking since all the “system” information is accessible to them (God forbid one of their own get caught in a bar), and 3. provides additional funding to the LDS church (they would consider this “bleeding the beast” – taking money from non-LDS sinners to fund their own agendas. Read Under The Banner of Heaven for more information on this principle). Though I have never spoken to a Mormon who will admit this or would even admit knowledge of this “Big Brother-esque” tactic, I cannot for the life of me think of other reasons memberships in Salt Lake exists. Not to mention no other state in this fair land has a membership policy such as Utah. The good news is, after all my ranting, that the law has finally been lifted. All in all good, but the alchomohal is still at the level of lame since it does not have as much kick as everywhere else (no joke, I have friends who have driven five hours to Wyoming to get normal liquor). In addition, to replace the membership law and further protect non-drinkers from temptation, all new drinking establishments – restaurants included – must build eight foot walls around their drink stations so no one can actually see those amazing beer caps being snapped off a cold Bud Light, or those shiny vodka bottles a-splish-splashing around while making a Greyhound. Oh, and drivers licenses are still scanned so one’s information can continue to be tossed to the church for good measure. We just don’t have to pay them to babysit us now. Congratulations, Utah, you made everyone think you’re one step closer to normal. Unfortunately, you have a long way to go. This entry was posted in Uncategorized and tagged 3.2 beer, alcohol, bar membership, big brother, bikram yoga, bleeding the beast, blockbuster card, bud light, frank sinatra, greyhound, lds chruch, lumpy's salt lake, membership, membership to get into bar, park city, polygamy porter, portland, salt lake city, salt lake memberships, Seattle, stupid membership law, under the banner of heaven, utah, utah alcohol, utah beer, utah drinking laws, utah liquor, utah membership law, vodka, wasatch brewery, wyoming liquor. Bookmark the permalink.